My Pop (Grandpa for those of you not in the know) has a way with stringed instruments. 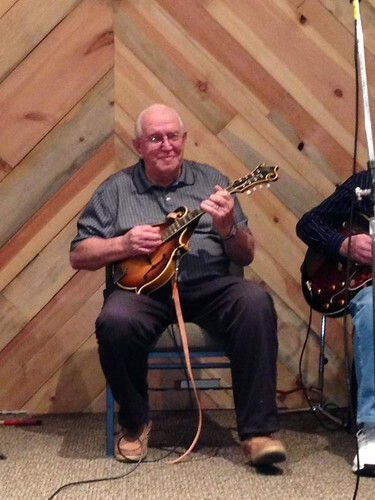 All my life he’s loved to get together with his buddies and do some serious Pickin’ and Grinnin’. For the last few years he gets together with some of those buddies and they play every Friday night. My cousin Bobi was visiting last week and went to listen to the Pickin’ and gave me the ok to post these. Pop’s on the right playing his mandolin. He also plays the fiddle and some guitar. I think he can play just about any stringed instrument, but the mandolin and fiddle are his favorites. This entry was posted in Friends and family, video and tagged Friends and family, video.